« The US 10k Classic is Back! I have been using PowerBar and GU gels for a while now on long training runs and prior to and during races. Some of them taste decent and some are just plain nasty. (Anything chocolate flavor would make me gag trying to eat and run at the same time.) These are essentially sugar and some electrolytes in a gel form which kinda reminds me of cake frosting. Not only do these gels coat your entire mouth, they are really tough to get down and run at the same time. If you are not near a water stop, don’t even take one, because you will immediately want to hydrate after the gel. I set out on a nice long run and 15 minutes in, decided to knock out the first 3 “Bloks”. The first thing I noticed was that the package made it very easy to portion out each gummy and that I could eat them at my own pace. Just tear off the top of the package and push them through. Whatever does not get used goes back into your pocket. With a gel, you have to eat it all at once or else become a sticky mess. Next, the flavor was SO much better than the gel. 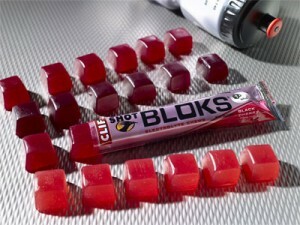 On flavor, there is no comparison – the Bloks beat the gels, hands down. Update: I recently tried the margarita flavor Bloks… These are supposed to contain extra salt for cramping. I don’t reccommend these on a long run. The salty taste is over the top – it was instant dehydration for me. You may like them, but I just couldn’t handle all that salt. All of the other flavors are quite good though. The Cons: Despite everything the Bloks have going for them, the one thing that I found is that they don’t give me the “sugar rush” boost that the gels do. It’s more of a gradual long-term energy thing. 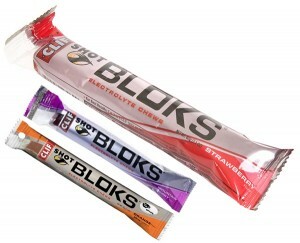 If I am hitting the wall and need that massive sugar rush – I will go for the gels. The Bloks just don’t seem to absorb the same way. That said, I now have more “Bloks” in my gym bag than gels now. What do you use? Hit the “comment” button and weigh in!